Two generations of this family have played for the Toronto Blue Jays. 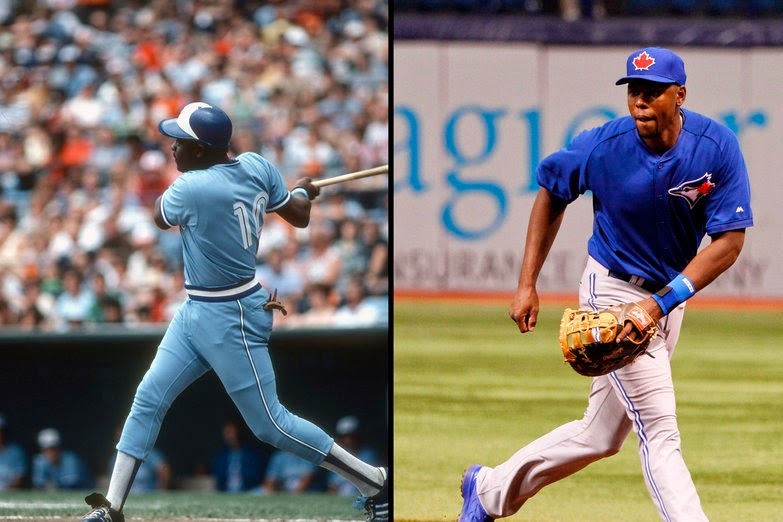 At left Is John Mayberry, who starred with the Jays from 1978 to 1982, while at right is his on John Jr. who was recently acquired by Toronto. The minute I saw the name I knew it had to be. It was too much of a coincidence to be one. The Toronto Blue Jays, struggling to stay in the American League baseball playoff race and in need of a run, sent a young player they just acquired to the plate to pinch hit. He delivered too, ripping a double down the third base line. Sadly, the Blue Jays would find a way to blow a two-run lead in the bottom of the 10th inning. That made it even more poetic. The man’s name was John Mayberry, and seeing his name reminded me of another Blue Jay named John Mayberry who played on a Blue Jay team that vexed me as much in the 1980s as this team does today. When the decade opened, John Mayberry was occupying first base for the Toronto Blue Jays, and was one of the team’s leaders, and one of its most productive hitters. He broke into the majors with Houston in 1968, playing parts of three seasons with the Astros with little success. Before the 1971 season, he was dealt to the Kansas City Royals where he would have his most productive years. (Interestingly, one of the first baseball cards I ever owned was John Mayberry’s 1977 card with the Royals). In his first year with Kansas City, the left-handed power-hitting first baseman hit 25 home runs and drove in 100 runs. He followed that up in 1974 with 26 home runs and 100 RBIs again. He hit 34 home runs in 1975, which was a team record at the time, and drove in 106 runs, which were both career highs. His production tailed off after that. He hit 13 home runs in 1976 and 23 home runs in 1977, although that tied him for the team lead with Al Cowens. After some spotty play that upset manager Whitey Herzog in the 1977 American League Championship Series against the New York Yankees, Mayberry was sold to the lowly Toronto Blue Jays before the 1978 season began. One of the first baseball cards I ever owned. According to Wikipedia, Mayberry never had the same success in Toronto he had in Kanasas City. That was due in part to the fact he went from a competitive, first-place team to the worst team in the American League East. It should be noted, the Blue Jays were an expansion team who played their first season in 1977, so Mayberry joined a team that was still virtually in its infancy. In 1978, Mayberry hit 22 home runs and drove in 70 runs, which are good numbers given he had no protection in the line up. The Blue jays finished last in their division too, with a record of 59-102. The next year, 1979, Mayberry numbers were almost identical, with 21 home runs and 74 runs batted in, as was his team’s record, as the Jays finished last again with a record of 53-109. That spelled the end of Roy Hartsfield’s tenure as manager, replaced by Bobby Mattick for the 1980 season. That year was Mayberry’s best as a Blue Jay, hammering 30 home runs and driving in 80 runs to help propel the Blue Jays to their best record to date at 67-95. The big milestone was losing less than 100 games for the first time in franchise history, and winning more than 60 games. Still, they finished last in the American League East yet again. That would be the last full season for John Mayberry as a Blue Jay. The 1981 season was marred by a strike, so the season was split in two halves. The Jays were 16-42 in the first half, good enough for last place again, but rebounded to go 21-27 in the second half and finish sixth. Mayberry’s numbers for the year had dropped off dramatically, partly because Toronto played 56 fewer games than a regular season. Mayberry started the 1982 season in Toronto but, after playing just 17 games, hitting two home runs and driving in three runs, the worst possible thing could happen – in my eyes. He was traded to the much despised New York Yankees, where he retired at the end of that season. In return, the Blue Jays received Jeff Reynolds, Tom Dodd, and Dave Revering. What Mayberry brought to the Blue Jays, especially in his later years, were the intangible skills of leadership and mentorship. The Blue Jays had started out as a team made up, almost completely, of castoffs and retreads. That’s how they stocked expansion teams back then. However, general manager Pat Gillick began to find young talent to improve his ball club and stock his system. Mayberry was the perfect fit for the team, bringing experience and guidance. I remember the way he hit towering home runs, and loomed over first base which seemed so small when he stood on the bag. Even after his trade to the Yankees, he would inquire how the young guys like Lloyd Moseby and Willie Upshaw were doing. I was sad to see him go generally, and almost heartbroken it was to the Yankees who were the best team in the American League. It was like the rich got richer and the poor Jays suffered. Little did I know that trade was part of the renaissance that was to emerge. The most intriguing part of the John Mayberry story for me is that his trade directly led to the Blue Jays success in the 1990s, including their two World Series championships. When Toronto traded Mayberry to New York, they received three players. Dave Revering was released later that same season and Jeff Reynolds never panned out, spending the rest of his career in the minors. However, Tom Dodd was traded back to the Yankees along with reliever Dale Murray later in 1982. In exchange, the Blue Jays received Dave Collins, Mike Morgan, and a prospect named…Fred McGriff. Before the start of the 1991 season, the Blue Jays traded McGriff and Tony Fernandez to the San Diego Padres for Joe Carter and Roberto Alomar who would be two of the cornerstones of those championship teams. 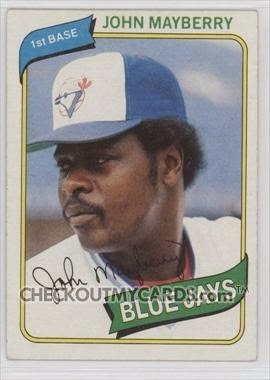 John Mayberry may have been the first Blue Jay I ever really liked, he may have even been my first favourite. He seemed to have this larger than life presence out there. He was intense, but could smile, and it was obvious he was one of the team’s leaders. Even if his numbers declined in Toronto, and he never had the same success he had in Kansas City, his impact with the Jays was great. This was a team that routinely lost 100 games a year. They offered their hitters no protection in the line-up. Hitting 30 home runs and driving in 82 runs in Toronto was like hitting 40 home runs and driving 100 on a non-expansion team. Hopefully his son will make his mark with the Blue Jays, because his dad sure did.